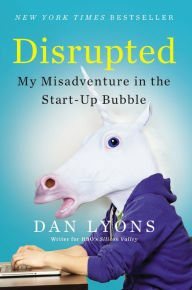 George Orwell would reel at the language and corporate culture brilliantly depicted by Dan Lyons in this year’s best nonfiction book about a workplace, Disrupted: My Misadventure in the Start-Up Bubble. “My year in start-up hell” might have been a better subtitle. It’s not exactly the corporate history book or branding exercise that Lyons’s ex-employer HubSpot would have commissioned, but HubSpot hardly seems print-oriented. Lyons is no angel either, though he writes like one. Reading Disrupted is like watching a 21st-century gladiator match. I tore through it without stopping, sometimes laughing out loud but more often gasping, and can’t wait for the inevitable TV movie. I was delighted to discover that Lyons (who cut his teeth in the magazine world when magazines thrived) just started writing a column for Fortune . It’s called “Disrupted” (d’oh!) and will focus on corporate life and culture. There are a lot of positive workplaces out there—I look forward to Lyons’s reporting on those, well as his takedowns of the baddies.